From June 23 to 25, guitarists had both questions answered at the first ever Vancouver International Guitar Festival. 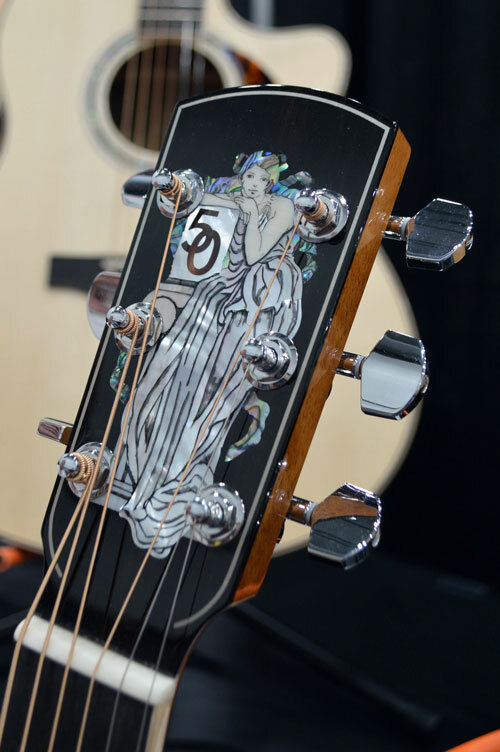 The event gathered a diverse group of sage and startup luthiers alike, whose handicraft told the vibrant story of Canadian guitar builders on the national and international stage. Few inaugural events successfully launch with a major milestone. But the team behind the Vancouver International Guitar Festival pulled it off by paying due homage to acoustic guru Jean Larrivée with the Luthier Industry Builder Award. Now celebrating 50 years in the industry, the forefather of the western Canadian luthier community recalls selecting humble Vancouver as his homebase for one simple reason: the spruce. Not unlike the farm–to–table philosophy of locally sourced cuisine, the show highlighted luthiers adopting the park–to–player approach of sourcing materials from sustainable and reclaimed sources. In the case of Meridth Coloma, the fallen timber of Stanley Park (Vancouver’s iconic coastal forest) provides unique and pristine tonewoods for a selection of acoustic guitar designs. For American builder Nick Pourfard of Prisma Guitars, it’s the skate parks of San Francisco that serve up an endless supply of snapped decks to be reimagined and reformed as one–of–a–kind masterpieces. With a limited run of acoustics constructed of reclaimed wood from the very walls of Jimi Hendrix’s childhood home, Vancouver Island’s Joi Guitars aimed to channel the vibes of Seattle’s first six–string prodigy. As Shaw Saltzberg, producer of the event, commented, “Our makers are plugged into sustainability in a big way on the west coast.” In these ways, the scene that started with an eye for the humble spruce has bloomed into generations of luthiers whose quest for innovation in sustainability is second only to their commitment to creative design philosophies. The axioms of form and function have resulted in something of a core repertoire of electric guitar shapes. Yet one of the themes that emerged from the festival was rookie and novice builders who at once embraced this classic heritage, while re–envisioning it with creative designs that hinted at something familiar but demanded head turns for their fresh looks. 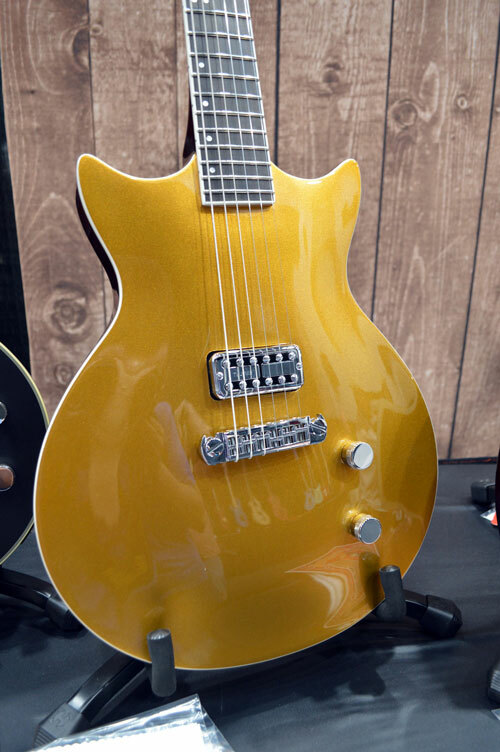 Following on a year of accolades pouring in over the Prestige Todd “Dammit” Kearns Anti–Star signature model, Mike is hoping to strike the market again with the newly launched Prestige DC Coupe. 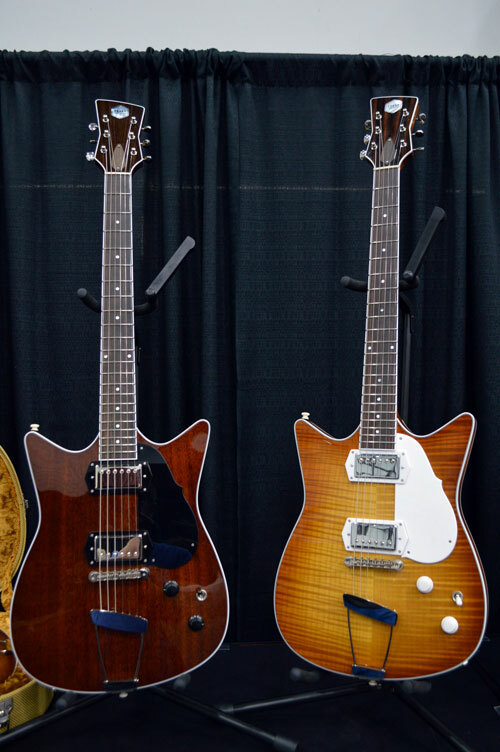 A 14–hour drive south in Sacramento, Doug Kauer of Kauer and Titan Guitars is taking the concept a step further by committing to an accessible range of retro–modern designs, with the added benefit of plug–and–play interchangeability of pre–wired and loaded pickguards. As noted by Saltzberg, when he first met with Vancouver luthier and musician Meredith Coloma to discuss the goals of the event, a core component of the vision was to provide a space and experience that would captivate the minds of young players with a simple yet astounding idea: that something painstakingly handcrafted out of wood was at the pinnacle of contemporary innovation. 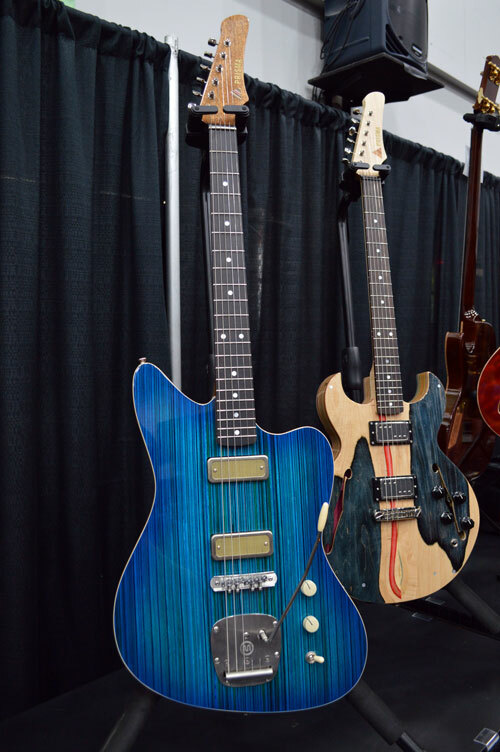 While any show is exciting for the gallery of instruments and gear it provides, the Vancouver International Guitar Festival was about collaboration and community for the builders who set up shop for the weekend. As Saltzberg and Coloma roughed out a plan for the event, it was about finding that perfect blend of “A–list” and emerging talent. 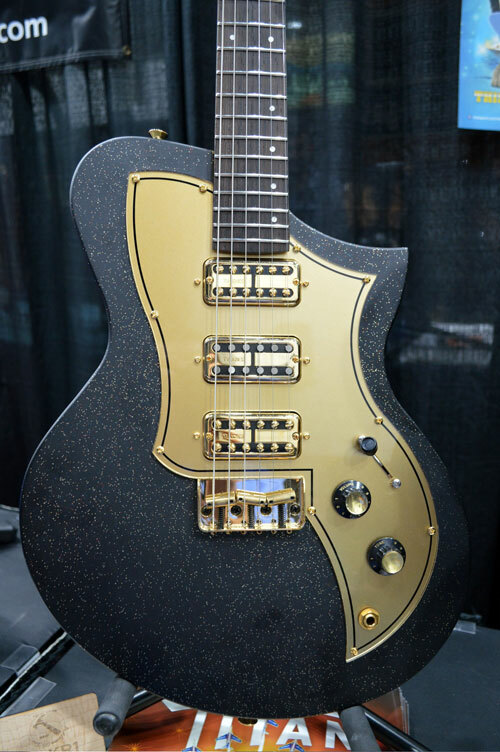 “Of course, we have a big guitar builder and instrument maker community in British Columbia, and we have a big one across Canada,” commented Saltzberg. The event provided an ideal space to bridge the Canadian and international scenes, as well as to connect different generations of luthiers. When asked about the significance of receiving the career contribution luthier award, Jean Larrivée said little about guitar making. Rather, for him, it signalled that effective apprenticeship was what made the most lasting impact. “When I started, there was nobody. Even here today, there’s many of my apprentices. 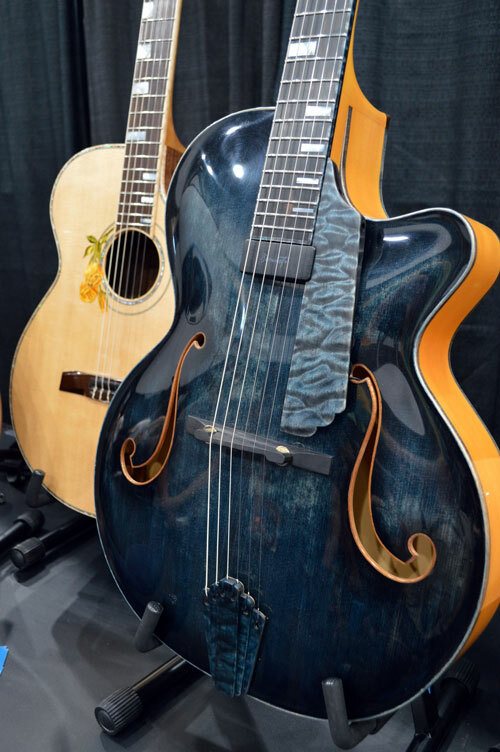 I’m proud of that, it’s a great privilege.” A perusal of the stunning guitars of Jean’s past apprentices who are now established builders in their own right — such as Grit Laskin, Linda Mazer, Shelley Park, and Jeff Letain — proves that the investment was well made. The community ethos was certainly evident throughout the festival, as builders took the time to both demo and discuss their builds, as well as entertain regular distractions from peers in the industry. As Kauer reflected, shows like this are as much about connecting for inspiration and the exchange of ideas as they are about presenting the latest from the shop floor. In the end, the event was a long–awaited and well–executed first for Vancouver. Its success in bringing together builders from across the sprawling True North and attracting international guests from further afield should be taken as cue to start planning for next year.